Today, I’m excited to announce that we have acquired Pirate Forms, a popular WordPress contact form and SMTP plugin, with over 300,000 active installs. Pirate Forms was created by ThemeIsle, the company behind popular WordPress themes Zerif and Hestia. They built the plugin in 2015 to add a simple contact form solution to their fast-growing themes. At the time, most WordPress form plugins were not beginner-friendly. That’s why in 2016, we launched WPForms with a single mission: create the most beginner friendly WordPress form plugin in the market. Since then, WPForms has passed over 1 million active installs and has an average rating of 4.9 out of 5 (with over 2400 five-star ratings). I have met Ionut (ThemeIsle founder) at numerous business conferences, and we always talked about increasing collaboration between our two companies. We both put user experience as our #1 priority and have a lot of similar philosophies regarding the WordPress product ecosystem. In his recent visit to United States and Awesome Motive HQ, we furthered our discussion on ways to work together and shared our respective growth plans for our companies. During our conversations, we both agreed that WPForms offers a more powerful and user-friendly WordPress form builder experience, and it meets all the requirements for ThemeIsle themes. The more we talked, the more it made sense for WPForms to acquire Pirate Forms, and for our two companies to work together in bringing the best user experience to the WordPress community at large. This brings us up to date with today’s announcement. WPForms has officially acquired the Pirate Forms plugin in an all-cash deal. What does this mean for Pirate Forms Users? This acquisition means that Pirate Form users will now have access to a modern form builder and powerful form features with WPForms. Previously, Pirate Forms free version limited users to creating a single contact form. Users had to upgrade to the Pro version for unlocking the ability to create more forms. WPForms Lite allows you to create unlimited forms for free, and it comes with a more modern form builder along with powerful features. 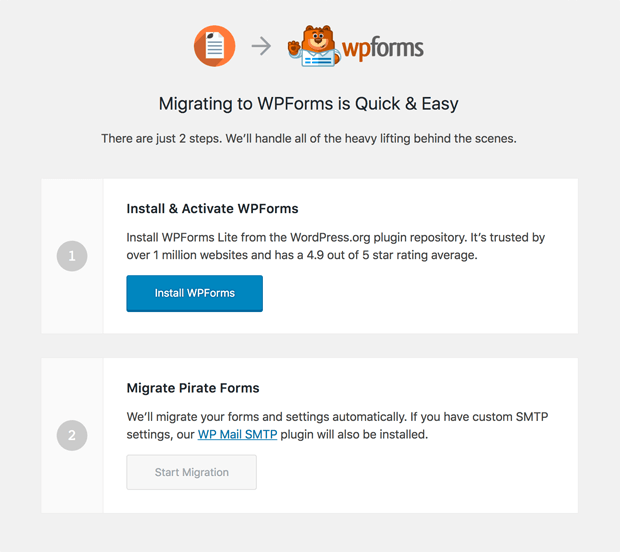 We have created an easy two-step migration process for Pirate Form users to switch to WPForms. This will make it seamless for you to move all your forms and settings with just a few clicks. If you’re a Pirate Forms Pro user, then you will get a complimentary one-year free license to WPForms Pro which comes with all features including payment integrations, email marketing integrations, surveys & polls addon, and tons more. You should be receiving an email from ThemeIsle regarding this shortly. As part of this acquisition, we’re retiring the Pirate Forms plugin in favor of the more powerful WPForms plugin. This means that there will be no new feature updates. We will continue to maintain the Pirate Forms plugin for any major security issues for the next 6 months. We strongly encourage all users to use our easy importer and switch to WPForms to unlock more powerful features (for free). 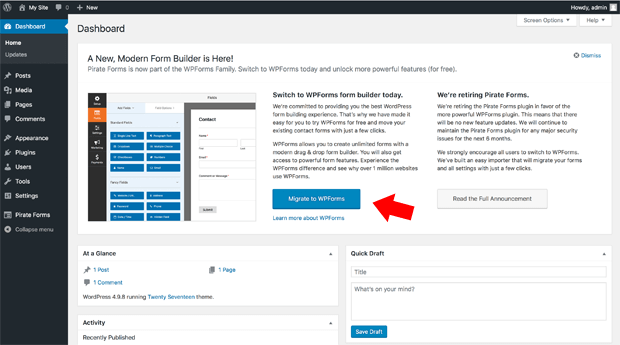 With the new Pirate Forms update, you will see a notice in your Dashboard to migrate to WPForms. Clicking on the Migrate to WPForms button will bring you to our two step migration wizard. The process is fairly easy after that. Just like everything else with WPForms, we labored for simplicity here to ensure the most seamless transition. For more detailed instructions, please see our documentation on How to Migrate from Pirate Forms to WPForms. What does this mean for ThemeIsle Theme users? All ThemeIsle themes including Hestia and Zerif are now 100% compatible with WPForms. If you purchased one of ThemeIsle’s bundled packages that came with Pirate Forms Pro, then you’re also eligible to receive a free one-year license of WPForms Pro. ThemeIsle will be reaching out to you separately via email. Important: Just so there are no confusions, we only acquired the Pirate Forms plugin from ThemeIsle (not the ThemeIsle company). What does this mean for WPForms users? This acquisition further strengthens WPForms position in the WordPress ecosystem. We would not be here without the support of our loyal customers, and I want to thank you for your continued support and trust in us. We have a lot of exciting new features in the works that we are planning on releasing in the upcoming weeks. In case you missed it, last week we announced the release the most requested Stripe Recurring payments feature for WordPress. The week prior to that, we released a brand new Gutenberg block, conditional form confirmations, new NPS survey templates, and more. Thanks once again for your continued support of WPForms, and we look forward to helping you create better online forms! It’s still going to be free to use after migrating? When you run the migration tool, you’ll be provided the option to upgrade to one of our paid licenses if you’d like — otherwise our free version will be installed for you automatically. In case it helps, here’s our tutorial on the migration process. I got a notice today stating: “Pirate Forms is now part of the WPForms Family”. So, if I do, is it going to break my existing reg form? I cannot afford it to be broken and down. That’s definitely understandable. I’d recommend keeping the Pirate Forms plugin active while you finalize the migration (move forms to WPForms, test those forms out, etc). That way, your users can continue using your current form(s) while you get everything set up. And if you have any additional questions about this process, please feel welcome to reach out! We’d like to help make the transition as smooth as possible for you.